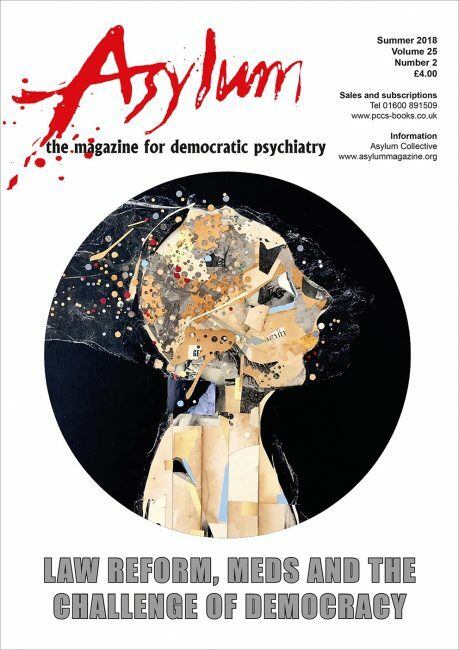 This issue opens with an article by @validconsent which underlines the profound challenges involved in our notion of ‘democratic psychiatry’. How does one provide a safe space for challenging and diverse opinions to be expressed: at a conference; on a psychiatric ward; on social media; or in the pages of our magazine? Those questions go to the very heart of Asylum’s collective struggle. They are crucial for those involved in the review of the Mental Health Act, as well as those who are framing responses to it. They are also key to understanding how debates about psychiatric medication can be conducted in ways that are respectful of deeply held and diverse views. These two subjects take up the majority of this issue of Asylum. The interim report on the Mental Health Act Review is out now. Unfortunately, but perhaps not surprisingly, two main demands referred to in this issue of Asylum – making legislation rights-based and consistent with the UN Convention on the Rights of Persons with Disabilities, and the idea of a capacity based Fusion law – have already been taken off the table (see the recent blog by Akiko Hart on www.madinamerica.com). Wide-ranging reform looks increasingly unlikely, though the suggestion that Community Treatment Orders may be abandoned will be heartening to many campaigners. A major question remains: how, in this current climate, will people be able to access support at all, and how can legislation be used to help or hinder that? We are pleased that some subjects raised in previous issues of the magazine are taken up in this issue – including in our letters pages. Whatever the challenges of democracy, we still endeavour to provide an open forum for debate, so please continue to send us articles, poems, stories, photographs, cartoons, letters, book reviews and drawings. Maybe you could pass on this issue or pin up a flyer.